Alexander Gray Associates presented an exhibition of work made in the 1990s by Gallery artists Jack Whitten and Melvin Edwards. Investigating the two artists’ paintings and sculpture of this significant decade, the presentation examines their formal and material experimentations, and their use of abstraction to convey artistic, social, and political commentary. The exhibition spotlights Whitten and Edwards’ artistic innovations, with a majority of works not previously exhibited. The selection also affirms the artists’ dedication to abstraction in a polemical decade broadly characterized by identity politics. Throughout his career, Jack Whitten has experimented with acrylic paint, pushing his chosen medium to its material limit. A pivotal decade for Whitten, the 1990s mark the point when he began creating acrylic tesserae through a complex process. Pouring the paint in a shallow mold and allowing it to dry, he cuts, tears, and shatters the resulting slab into smaller pieces, effectively making “tiles” out of paint. For Whitten, these tesserae are vessels of information, like DNA or pixels, connected to the realms of science and technology. In 28 Black Holes (Dedicated To Jackie O) (1993–94), Whitten pieces together these pixels of acrylic to configure a larger painting. Amazing Popcorn (1994) echoes this idea, as twelve distinct tesserae paintings come together to form one composition. 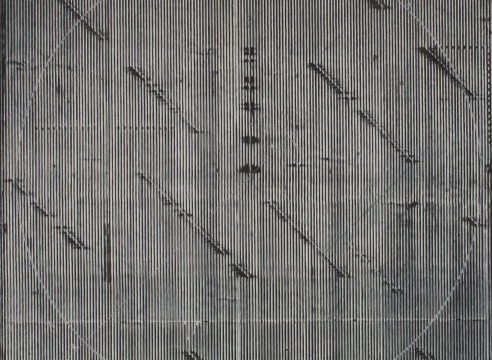 Whitten is currently the subject of a major retrospective organized by the Museum of Contemporary Art San Diego, CA, traveling to the Wexner Center for the Arts, Columbus, OH and Walker Art Center, Minneapolis, MN. Melvin Edwards creates sculpture by manipulating and welding together steel industrial and agricultural objects. With a formal emphasis, these materials unfold multiple layers of symbolic significance as they relate to African and African American history and culture, as well as Edwards’ autobiography. 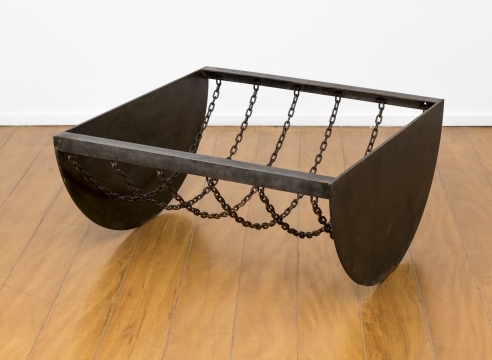 Emblematic of the works on view, Edwards incorporates chains into his sculptures, which speak to the history of slavery and oppression while simultaneously representing the links between people and cultures. Since the 1970s, he has consistently traveled throughout Africa, which is often reflected in his titles, such as Igun Eronmwon (1993), a street in Benin City, Nigeria where bronze casting families live and work. Lo (For Locardia Ndandarika) (1997) is named after Locardia Ndandarika, a Zimbabwean stone carver whom Edwards met during his first trip to Zimbabwe in 1986. Edwards’ second retrospective will open at the Nasher Sculpture Center, Dallas, TX in January 2015. The Gallery’s contribution to Art Basel Miami Beach’s Film Sector features the work of Tomislav Gotovac, a pioneering figure in Eastern European film and performance. Gotovac is primarily concerned with structure over content, and his films investigate varied cinematic methods and techniques, often reduced to their most basic levels.